LA CLINICA Organic for Baby products are formulated to ensure the utmost gentleness, nurturing, safety and comfort for your baby’s total skincare needs. 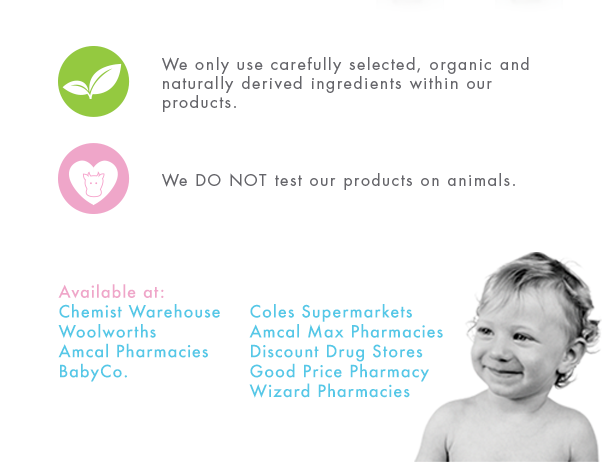 We only use carefully selected, organic and naturally derived ingredients. Australian Made and Owned. At LA CLINICA FOR SKIN & BODY, we pride ourselves on our products, in particular, for their purity and gentleness on baby’s skin. Health and safety are of the utmost importance to us, hence why we only use carefully selected ingredients, in particular, the organic ingredients in each of our products. Our quest for purity goes so far as to use spring water, whenever possible, in the manufacturing process of LA CLINICA products. LA CLINICA has its own certified organic farm, which produces spring water rich in silica. The farm is located in the spa region of Daylesford, Victoria. Our products are formulated to ensure the utmost gentleness, nurturing, safety and comfort for baby’s total skincare needs. 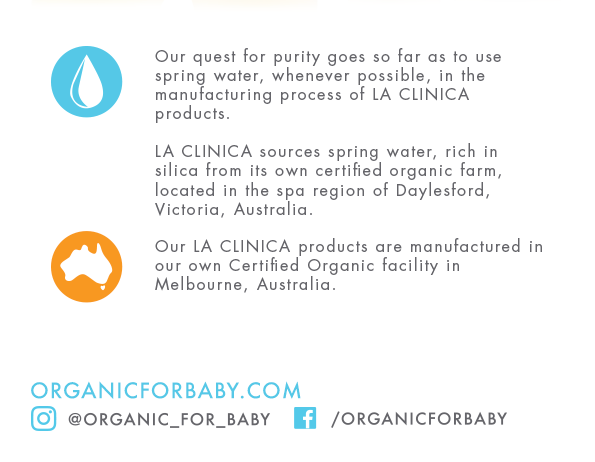 LA CLINICA Organic for Baby is now available at Chemist Warehouse, Coles, Woolworths, Amcal, Amcal+ (Amcal Max), Discount Drug Stores, Good Price Pharmacy, Wizard Pharmacy and BabyCo.